July 29, 2016 By This post may contain affiliate links. Take your cereal treats to a whole new level. 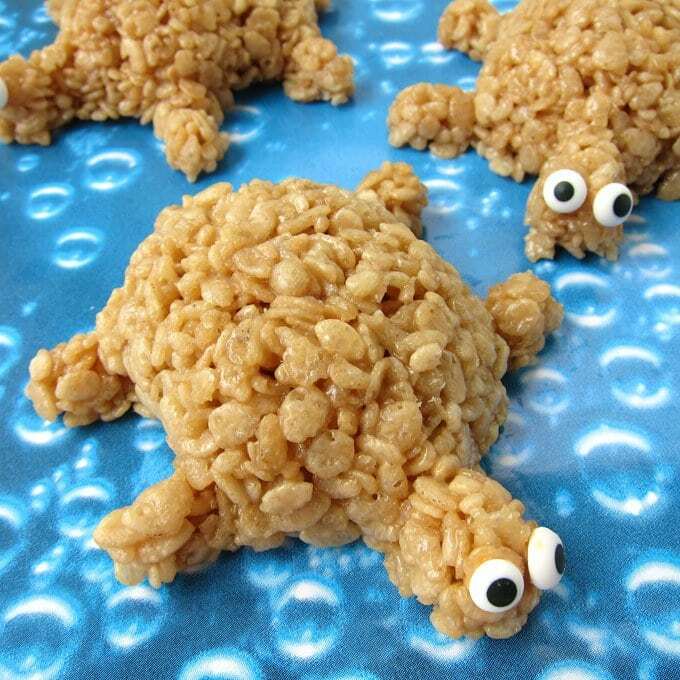 Instead of marshmallows, coat the crisp rice cereal in caramel, then mold them into adorable Caramel Rice Krispie Treat Starfish and Turtles. If you’ve never had a cereal treat coated in caramel, you’ve got to try these. 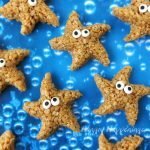 Whether you make them into cute shapes, like these sea stars and turtles, or not, this recipe is a must. You’ll be happy to know that you wont even need a candy thermometer or fancy equipment to make them. Just grab a saucepan and some plastic sand molds. Ya, know, the kind you use at the beach. You’ll want brand new molds that have been washed well in hot soapy water. Don’t worry, they wont actually touch your cereal treats, as you’ll line them with plastic wrap, but it’s just always a good idea to start with clean molds. You can use any shape or size mold you like. I chose turtles and starfish. A few years ago, I made an entire cereal treat sand castle using this same technique. Just like traditional marshmallow cereal treats, they look pretty good plain, but you might want to make them even more exciting by decorating them. I added some modeling chocolate shells to my turtles and being I made these for my nephew’s beach themed graduation party, I topped a few of them with chocolate graduation caps too. You can use any type of candy or chocolate to make your decorations then attach them using piping gel, corn syrup, melted chocolate, or frosting. For the animals, even just adding candy eyes makes them look cuter. 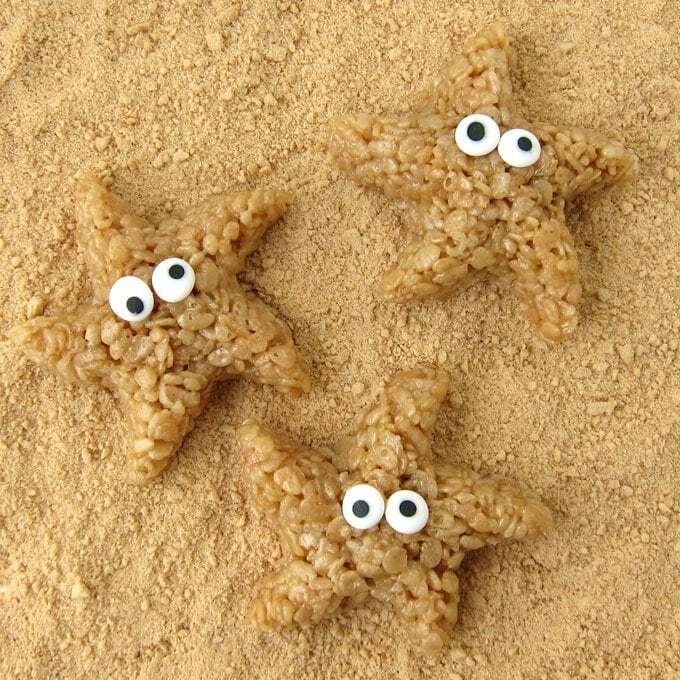 Rice Krispie Cereal coated in a decadently rich caramel can be shaped into starfish and turtles using plastic sand mold beach toys. Place butter, brown sugar, and corn syrup in a medium saucepan. Heat on medium, stirring as needed, until butter melts and mixture begins to bubble around the edges. Place lid on pan for one minute. Remove lid and allow to boil for 2 more minutes, without stirring. Remove from heat and add sweetened condensed milk, stir to combine. Return to medium heat and allow to boil for three minutes. Pour over cereal and stir until well combined. Line plastic molds with plastic wrap. Press to compress cereal so that it holds it's shape. Un-mold treats and allow to cool completely. Decorate, if desired by attaching candies using edible "glue." If you’d like to see detailed step-by-step tutorial for making the caramel rice krispie treat recipe, check out this Caramel Rice Krispies Treat Sand Castle tutorial. You’ll see lots of pictures and tips and tricks. 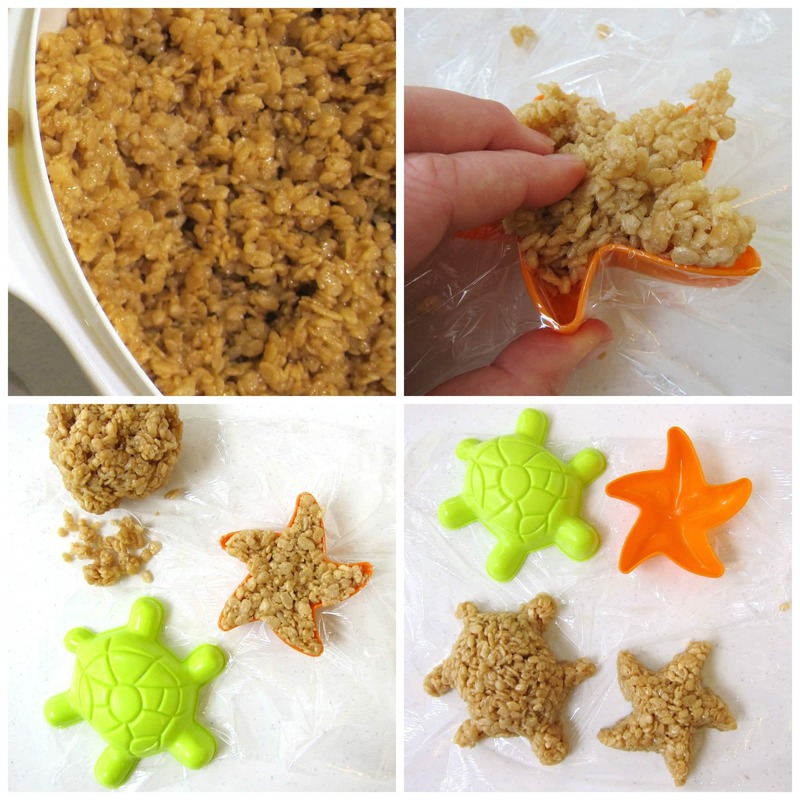 Once you have the cereal mixture made and cooled, you are ready to create these cute starfish and turtles. Line your plastic sand molds with plastic wrap, then simply fill the mold with the caramel rice krispie treat mixture. Press down on the cereal to compress it so that it holds it’s shape. Then pull up on the plastic wrap and pop the treat out of the mold. Lay the plastic wrap over the mold and repeat. This recipe makes a lot of treats, but the actual number will depend on the size of your molds. Use piping gel, corn syrup, melted chocolate, or frosting to attach the candy eyes or any other decorations to your treats. You can store these for a few weeks in an airtight container. 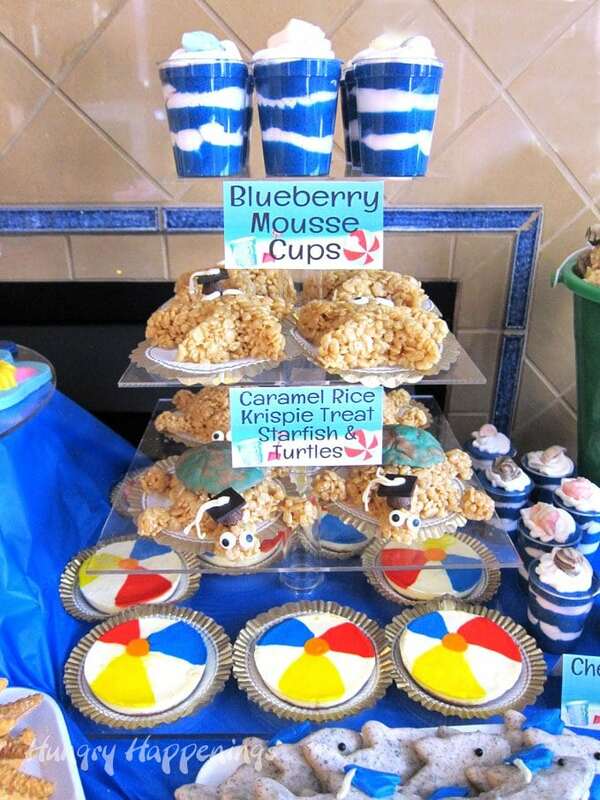 These treats will make a great addition to your beach or pool party. They were quite popular at the beach party we had earlier this summer. I loved hearing the party guests talk about how they loved the caramel flavored treats and seeing how quickly they all disappeared. 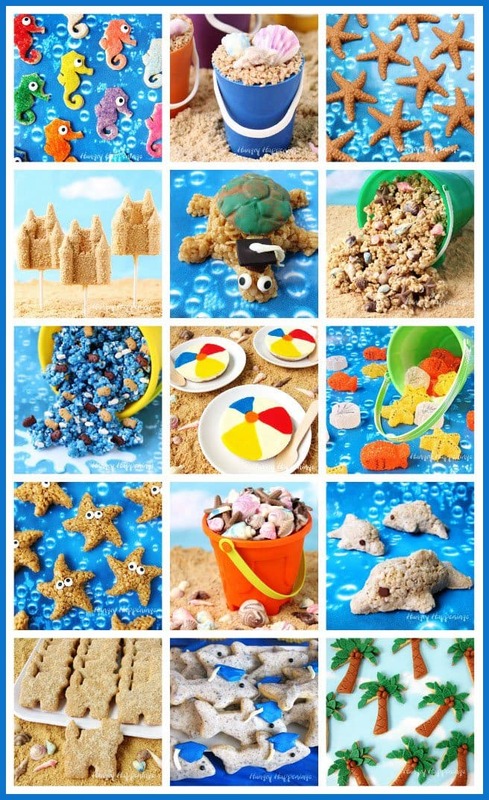 If you are hosting a beach part or pool party, you might also like to make some of these other fun summertime treats. 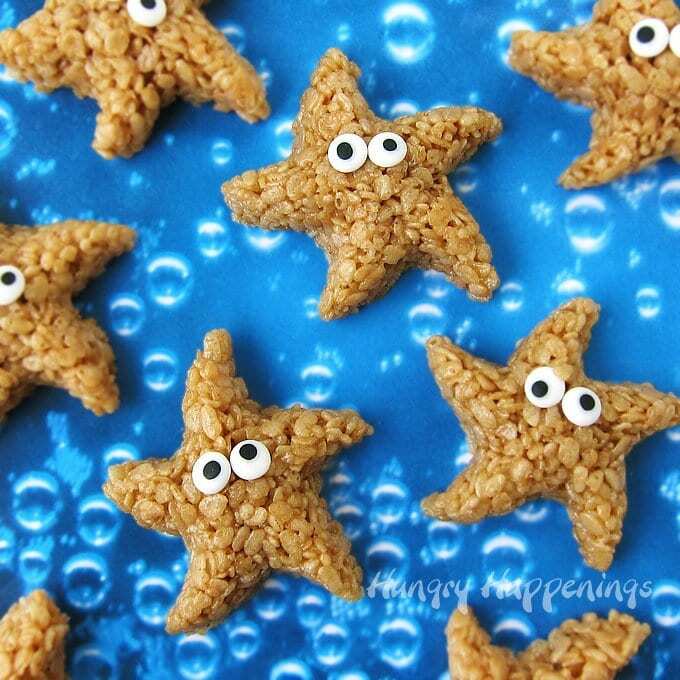 If you recreate these Caramel Rice Krispie Treat Starfish or Turtles be sure to link to this post and/or tag @HungryHappenings on Instagram and send me a picture so I can share it in my Readers’ Gallery. What?? Caramel on RKT? I can’t believe I’ve never had this combo, now I have another way to LOVE a RKT!